Halloween is full of fun makeup looks, from cute animals to terrifying supernatural creatures. You've selected the perfect costume; next is the Halloween makeup. Makeup is a great alternative to masks, which can be an uncomfortable and impractical, especially for children. Kids cannot see very well through a mask when trick or treating and that can quickly become a hazard as darkness approaches and they are running around the streets. Even if you are not a child, a mask can be hot and constricting, especially at a party or while trying to consume those favorite Halloween treats! 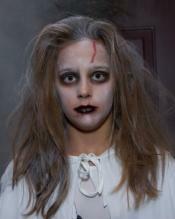 Halloween makeup is the best solution as you can easily remain in disguise without the hassle of a mask. Makeup also transforms your face and body into the character you are trying to portray, instead of simply feeling like you are wearing a costume. No matter what look you're going for, use this basic process. Buy face paint or make your own. Never use real paint, only products specifically designed for use on your skin. Sit down in front of a counter or table with a mirror and spread out all your tools and makeup. Wrap an old towel around shoulders and neck. Always tie hair back when applying makeup. Always wash your face first and dry completely. For oily skin, apply astringent - witch hazel is a good choice - to help makeup stay better on greasy skin. Apply the makeup to achieve the look you have in mind. Once your makeup is complete, cover entirely with translucent powder to minimize smearing. To create basic clown makeup, start with a thick layer of white pancake makeup over the entire face and neck. 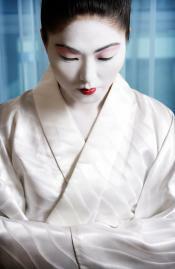 Let dry completely and apply white powder over the face makeup. You can use baby powder. Once the face is set with white, add color. Create an expression by enhancing facial features in a comical way. Paint on new eyebrows - as yours should be hidden by the white paint. Raise the eyebrows way up to create the clown look of surprise. 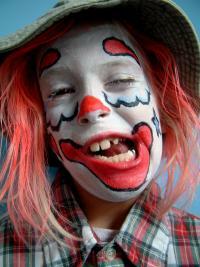 For a classic clown face, remember to add a black cross on each eyelid and a painted teardrop under one eye. Lastly, enclose your hair completely with a stocking cap. For scars on your skin, you can use gelatin for a simple but realistic look. Combine the gelatin with very hot water and stir. Let it cool to a comfortable temperature to place on your skin; ideally, it should be room temperature but still gooey. Mold this mixture onto skin in the shape of a scar or other icky effect. 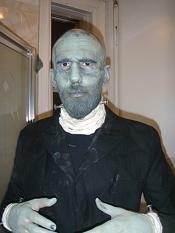 Once dry, you can add foundation to create a skin tone look or red food coloring for a more bloody appearance. White school glue, like Elmer's, is safe for use on the skin as it is completely non-toxic and easy to remove. 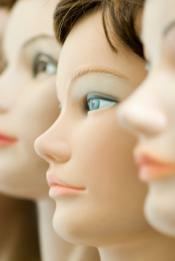 Unusual skin textures or wrinkles are simple to create with white glue. For wrinkles, apply a thin layer of glue to skin stretched out by your fingers. Dry the glue quickly with a hair dryer on low or let it air dry. Once the paste is completely dry, release the skin for instant wrinkles. To create this effect all over, work in small patches at a time. For bumps and other skin distortions, apply other materials to your skin with white glue. A great example is to use dampened cereal flakes with white glue for a monster-like skin texture. Utilize white glue again for moles or warts - great for witches or celebrity costumes. Glue puffed wheat cereal onto the skin. Once dry, color black or brown with makeup or face paint. To temporarily black out a tooth, apply eyebrow pencil to a completely dry tooth. This will hold for a little while and eventually fade away. If a longer look is desired, buy tooth black such as Black Liquid Tooth Out at a costume shop or online. To create glamorous princess makeup, apply a basic layer of face makeup to liven up the face. 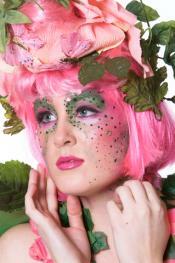 Then add shimmer and glitter to the entire face and body for a more fantastic image. From there, you can create a specific look you may have in mind, or you can add painted stars to channel a more whimsical look. You can do your own Halloween vampire makeup using basic makeup supplies. Start with a very pale foundation over the entire face and slick hair back from your forehead with a strong layer of gel. Draw a widow's peak at the center of the hairline with an eyeliner pencil. Use dark brown or grey eye shadow around the eye sockets for a sunken effect. Finish with a blood red lipstick and possibly a dribble down the side of the mouth. 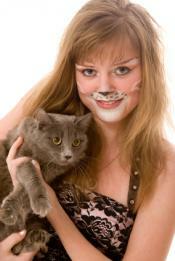 Animal face painting is great for Halloween. Select a base color that fits with the animal you have chosen. Apply this color over the entire face and neck area. Next, spread a lighter version of this color - either mix with white or use a different shade - with a flat paint brush above the eyebrows, on the cheekbones, underneath the nose, and on the chin. Blend lightly. This will highlight and emphasize your features more like an animal's face. Follow the highlighting with a darker pencil or face paint to fill in the eyebrow area. Also, use this darker color to draw one long stripe down the forehead and under the eyes and finally outline the lower cheek. Blend the edges slightly. This combination of base plus the light and darker contouring will cause the face to appear to protrude more like an animal's snout. Test the technique a few times to get it right. Lastly, blacken the nose and add whiskers. 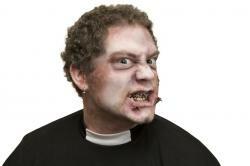 If you need more Halloween makeup inspiration, try one of these great ideas. Test for allergies on the inside of your wrist a couple of days before applying makeup to the entire face. Always try out the look before the big night or event, and experiment to see what you like. 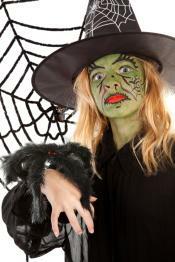 With children, sit down and solicit their help in designing their Halloween makeup. Even draw the designs on paper to be sure you have exactly what they are looking for. It is also important to completely avoid the eye area with children as they tend to rub and touch their face often. Use feathers or sponges as a paintbrush for a various effects. Mix makeup or paint colors to find the perfect shade for the look you want. When trying to emulate a particular creature or person, scrutinize a picture and look for specific identifying features to highlight in your Halloween makeup. Halloween is the ideal time to try out new makeup techniques and products. Experiment with glow-in-the-dark makeup, special effects paint, and other great products to get the perfect look to complement your costume.